﻿ William E. Dalton Gallery - Home of ABC Art - Ohio. Find It Here. 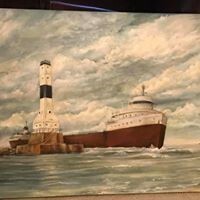 William E. Dalton is a local artist famous for his beautiful paintings of Conneaut and delicate hand-painted Christmas ornaments. Bill is joined at his gallery by Jodi Brecht, director of ABC Art, an art program for young students. Bill gives art lessons in his studio as well. Together, Bill and Jodi reach students of all ages. Hours are: Tuesday  Thursday 12:00 noon  7:00 p.m.Friday 12:00 noon -5:00 p.m.Saturday 10:00 a.m.  2:00 p.m.